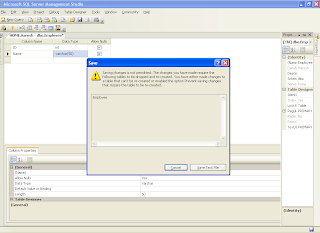 Error during save changes of sql table design in SQL server management studio 2008. 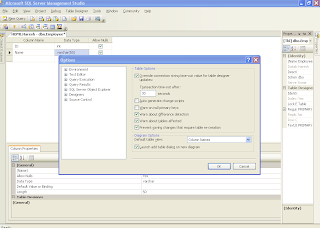 In SQL Server Management Studio 2008,if we open table in design mode to make changes and then click save after making changes in table structure it will give error. this is due to there is "Prevent Saving changes that require table re-creation" option is enabled in SSMS-2008. To work around this Just Un-Check "Prevent Saving changes that require table re-creation" option from Tools > Options >Designers.